Columbia County, OR – If you have been searching for a job or a new career, attend the FREE Columbia County Job Fair on April 6th, 2018 from 10:00 -3:00 PM at Columbia City Community Hall 1840 2nd Street, Columbia City, OR to meet employers who want to help you get a job either locally or regionally. This event will open early at 9:00 AM for Veterans. 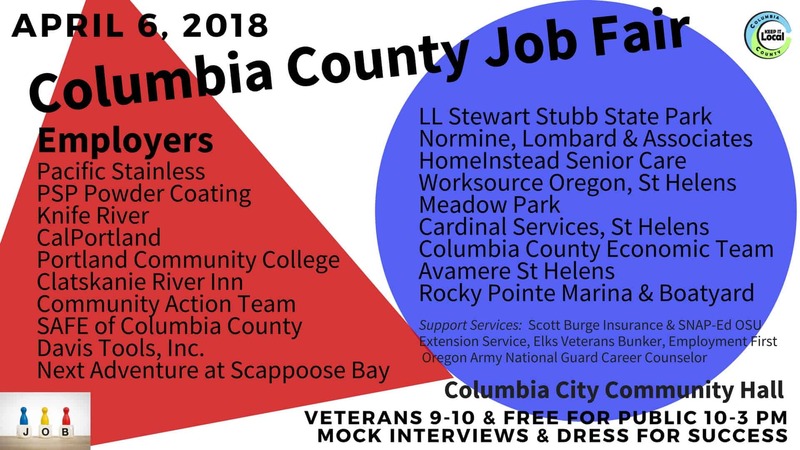 Many industries such as Manufacturing, Transportation, Tourism, Health Care, Social Services will be represented at the Job Fair from Columbia County and surrounding areas that are looking for employees such as Pacific Stainless, Davis Tools, LLC., Knife River, Next Adventure at Scappoose Bay, Community Action Team, Cardinal Services of St Helens, and many more. Over 19 Businesses will be on site for Job Seekers to share their resume and network. Attendees will also have the chance to practice their interview skills from 10AM-2:00 PM. Mock Interviews will be done by local professionals who hire and will provide feedback to the interviewee. Job Seekers can also find Support Services at the fair which will include First Employment, SNAP-ED OSU Extension Service, Oregon Army National Guard Career Counselor, Elks Veterans Bunker & Scott Burge Insurance to offer free help on health insurance plus additional resources. Job Seekers can also take the CC Ryder just get off at the Columbia City Stop it’s a short walk to the Community Hall.